In case your new computer lacks a CD drive you can (must) transfer the ISO file to a USB stick and make it bootable. A) “My” Android-x86 systems can be installed to a USB stick with persistence. I.e. all system changes are saved directly on the stick. This is how it is done. 1. Format a “good” USB stick with the ext4 filesystem. This has to be done in a installed Linux system or while running a live Linux system from CD or a USB stick. 2. Insert your formatted USB stick and start up one of “my” Android-x86 systems (Nougat, Marshmallow, Lollipop or KitKat) from CD. In the slideshow below I’m installing AndEX (Lollipop 5.1.1) to my USB stick SanDisk Contour. NOTE: You may have to reboot a couple of times before everything runs smoothly. The Grub boot lines for AndEX Nougat 7.1.1 shall look like this. NOTE 1: The DPI=140 entry provides a hint about the display’s pixel density in dots per inch. This is an important setting – if the Android display’s icons and text look too small and crowded, increase this number. If things seem too big, make it smaller. NOTE 2: The UVESA_MODE=1920×1080 entry describes the display size. This is also an important setting. If you know your display’s actual dimensions, enter them here. But not all dimensions work – it sometimes happens that a display specification that’s possible in principle isn’t feasible in practice. Above I presume that you have only one hard drive (/dev/sda). Then your USB stick will get the designation sdb1 and “root” will be hd1,msdos1. This problem with ext3/ext4 (error 963) is only applicable for AndEX/Lollipop (Builds prior to Build 151010). I.e. Google Play Store will work as expected in my KitKat version of Android-x86 and in AndEX Build 160215 even if the Android system is installed on an ext3 partition. Of course also in my latest AndEX build – AndEX Nougat 7.1.1 from 170201. B) The installation can also be done in Windows with Rufus (Create bootable USB drives the easy way). Download Rufus. Rufus will recognize your inserted USB stick automatically (but check it carefully anyway). Find your downloaded ISO file and start Rufus. The created AndEX USB stick with Rufus will work perfectly! Just restart your computer and have fun! NOTE: Persistence won’t be enabled. For persistence you have to follow my advice’s under A). NOTE re. C): Persistence won’t be enabled. For persistence you have to follow my advice’s under A). You’ll have to make changes in BIOS (boot order) so that your computer will start up from the USB stick before the hard drive. On a new computer you may also have to change from UEFI Boot to Legacy Boot. The installation procedures are the same for my other Android-x86 versions. Note also that you have to use a “good” USB stick. Certain “bad” brands won’t work. They can’t be made bootable. I myself have experience of brands Kingston DataTraveler, SanDisk Extreme USB 3.0 and Sony Micro Vault. The first two works (for me). You shall not use USB sticks of older model. They may work, but mostly bad. Use a USB 3.0 stick if possible. Note also that you may have to format the USB stick in advance using for example GParted. Try that if you can’t boot from the stick! 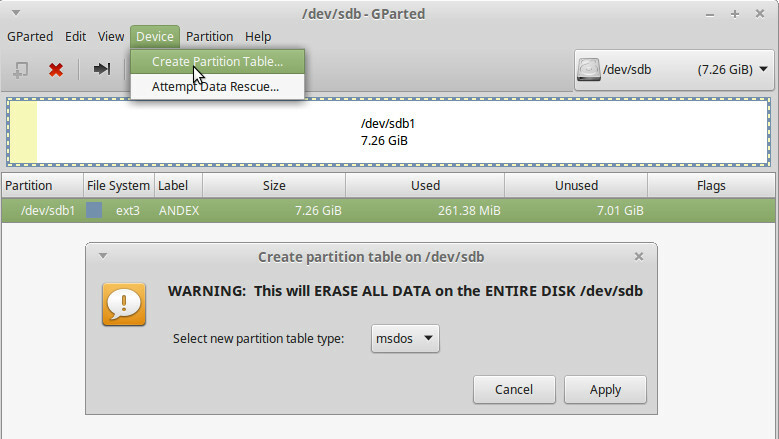 You may also need to create a new partition table on the stick. I can look like this when it is done in GParted. Nej, jag har aldrig påstått det heller. För att kunna spara dina inställningar och nya installationer m m måste du installera till USB-sticka på sätt som jag beskriver på http://andex.exton.net/?page_id=31 under A). Om du gör så så får du en väldigt bra sticka. Använd helst en 3.0 sticka (för snabbhetens skull). Om du tänker installera Android-x86 måste du alltså formatera stickan med ext3. Detta för att Grub ska kunna installeras. Kolla noga först vilken beteckning din sticka fått (/dev/sdb1, /dev/sdc1 eller…) så att du inte oavsiktligt raderar någon disk. Se också till att det bara finns en partition på stickan. AndEX (Android-x 86 I bought this product I installed 5.0.2 GAPPS Lollipop stopped error and closes the help me. Please submit the new version exists to address the error-free mhb1968@gmail.com Thank you. Did you install the system without running it live first? Which new version do you mean? I was wondering if it would be possible to install this on PC Desktop machine that doesn’t have a wifi card. dvs can the AndEX|Android-x86 Custom communicate to the outside world thru a wired network card? i would like to know ifi ti will read external usb HDD? and what about internal hdds? No, you can’t reach external or internal hdds while running AndEX Marsmallow. you can install android direct to hard drive and use the es file browser to access other drives,pen drives,sd card from the es file browser. I’m sure Es File Explorer works the way you say in other Android-x86 systems, but unfortunately not in Android Marshmallow. You are right in a way. My USB external hard disk and my “normal” USB sticks could be reached with Es File Explorer! Sadly not my internal hard drives. Thanks for the tip! How did you do the installation? I installed on my laptop, all Ok, all working, but from 250Gb(hard disk) available 287Mb, How create SD Card?